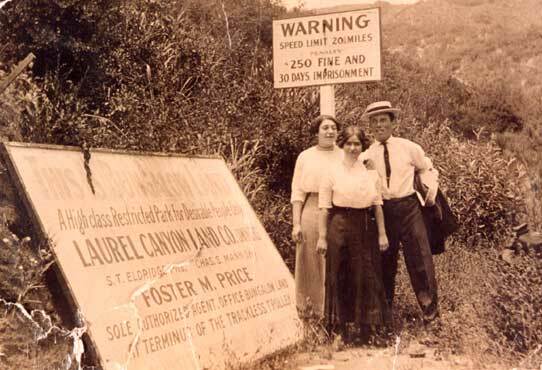 Selling paradise: A sign advertising a subdivision in Laurel Canyon around 1910. 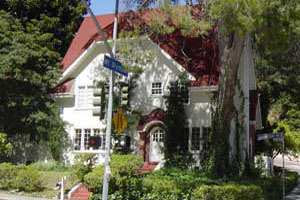 The homes in Laurel Canyon reflect a wide variety of residential styles. With over one hundred years of development history and an eclectic population, it’s no wonder that one residential style has failed to dominate. Nevertheless, there are dominant themes that become more obvious when we look at the record. 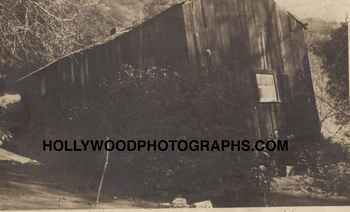 This photo, taken in 1902, is identified as the first house in Laurel Canyon. Courtesy HollywoodPhotographs.com. Before the Spanish, Native Americans made their dome-shaped reed huts from materials gathered in the marshes. Most of these settlements were at the mouth of canyons that provided fresh water streams. So, it’s logical to assume that a small village existed at the foot of Laurel Canyon; and, it’s rumored that caves at the bottom of Lookout Mountain Avenue served as temporary shelter for hunting parties. Until the late 1800’s, however, there is no evidence of any permanent structures in Laurel Canyon, and the earliest dwellings were mostly crude shacks built by homesteaders, hermits and the occasional bandit. A reminder of the earliest mountain retreats built around the turn of the century. Despite conflicting land claims by the railroads and homesteaders, transaction records show that some parceling of land in Laurel Canyon had begun as early as 1880. The lots were mostly sold as mountain hide-a-ways, and the structures that were built on these lots were either log cabins or cedar-sided cottages. Access was by horse-drawn carriage until the grade became too steep. From there, residents made their way on foot or on horseback. Water came from natural springs. Food presumably came from nearby farms and hunting. The lifestyle was very primitive. Examples of English Cottage, Spanish, Mediterranean and Cape Code style homes built prior to 1940. The first substantial residences were built around the turn of the century on farmland at the base of the hills and along the lower mouth of the canyon. The Hollywood area was still very rural and a lengthy travel from downtown LA, so these homes served mostly as country estates for people who made their fortunes in the city. The style reflected an obsession with European romanticism and included English Tudor and Spanish styles (also known as Cottage and Mediterranean styles). As the town of Hollywood grew, Cape Cod styles that appealed to middle class buyers began to appear. Many examples of each can still be seen today. A Craftsman-style home with an Oriental influence built for ____ in _____. 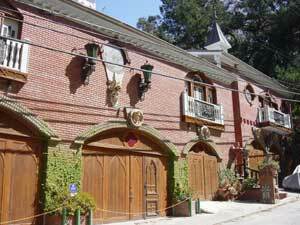 The residential style known as American Arts and Crafts and popularized by architects, Greene and Greene, was more prevalent in Pasadena, but we have some examples here in Laurel Canyon. 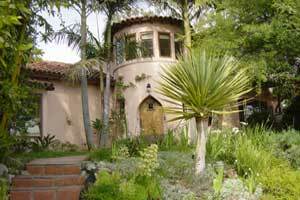 These homes were also built in the early twentieth century; and, the owners included the stars of the new silent film industry, many of whom were attracted to the rustic, secluded enclave of Laurel Canyon. Los Angeles was growing, but another movement was powering the future parceling and development of Laurel Canyon. That trend was spurred by the realization that living in the crowded, polluted cities of the East was unhealthy. The West, however, was paradise. 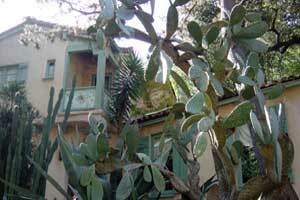 Peaceful, wooded mountain areas, like Laurel Canyon, would be marketed as healthful residential alternatives. 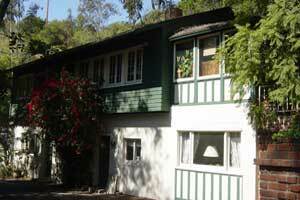 In fact, this was the vision of Charles Mann and other early developers of Laurel Canyon. Wonderland Park, one of the first subdivisions, was a great example of brand naming and marketing. Who wouldn’t want to live in a wonderland that was also a park? 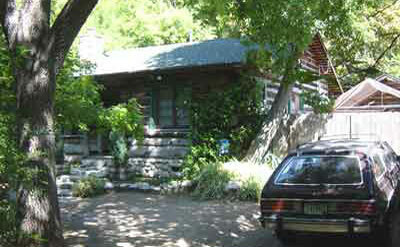 Example of a bungalow-style home built on Stanley Hills Road. The homes that were built on these tracks were much more modest and priced for the middle class that was beginning to swell the new cities of Los Angeles county. It was the beginning of the 20th century and a new era. The design style reflected a new approach to residential architecture that incorporated a back-to-nature philosophy. Homes in this style were called Bungalows, and the theme was popularized by the work of Greene and Greene. One track in Laurel Canyon was even called, Bungalowland, and a trackless trolley was built to bring customers to it from the tramline that ran along Sunset Boulevard. 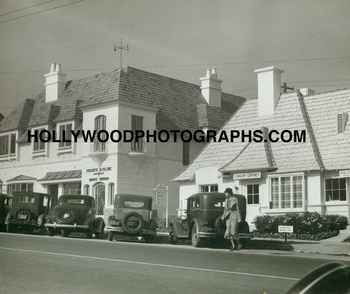 Sunset Boulevard with Regency style shops, circa 1930. Courtesy HollywoodPhotographs.com. With residential development of the farmlands and the mountains came increased demand for services and shops. In the 1920’s and 30’s, most of this development was along the Hollywood and Sunset boulevard corridors. The commercial buildings and apartments that were built were a far cry from the feed stores and cash markets that had existed before. The new style was a reflection of the sophistication and wealth of the new residents and celebrated the Continental building style known as Regency. It was an odd style, partly French and partly modern, that had nothing to do with local culture, climate or building materials. With its mansard roofs, fake chimneys, gables and draped picture windows, it was a fantasy in keeping with the entertainment industry that was rapidly replacing agriculture as the primary employer in Hollywood. With World War II came a torrent of change. Kaiser built a huge steel mill in the area to serve the new aircraft, auto and ship building industries that were required to fight a second war in the Pacific. Men out of work during the depression had always been drawn to California, but now they came in a flood. A wartime scarcity of materials led to innovative ideas to house these people including the Quonset hut, the geodesic dome and lightweight steel-frame construction. Young architects believed that the new post-war era would finally usher in an efficient, low-cost approach to residential architecture — a style that was free of the Mannerist appliqués and bric-a-brac that characterized the Tudor, Spanish and Regency styles. Case study houses by Craig Ellwood (No 18) and Pierre Koenig (No. 21) built in 1956. 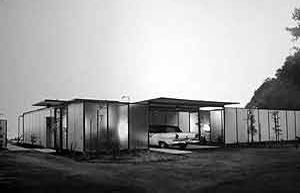 Many architects had been experimenting with Modernism, but it took the rebellious California magazine, Arts and Architecture, to set the movement into high gear. 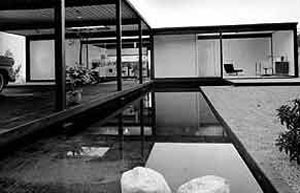 In 1945, the Editor, John Entenza, announced a competition to build a series of case study houses that would serve as models for the new residential modernism. 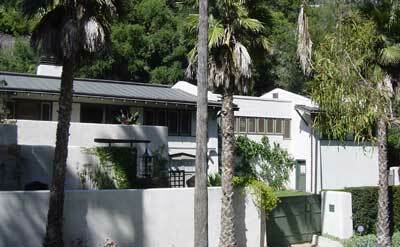 Several of these Case Study Houses were built in Laurel Canyon and can still be seen today. The hallmark of the style was light construction, an open connection with the land and a low profile. Site, view and sun dictated the form. The result was an integration of the natural and man-made. This was a striking departure from an earlier building philosophy that reflected man’s mastery of the environment. 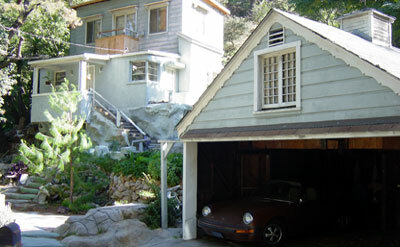 The 1950’s and 60’s saw the rapid development of nearly every feasible building site in Laurel Canyon. Most of the lots were bought by spec developers, who built homes using off-the-shelf plans. 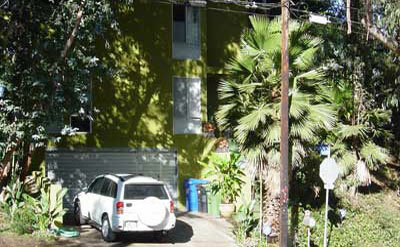 For instance, if the lot was steep, they’d simply add stilts to a flat lot home style. New subdivisions were approved, and with them came safer, wider roads. Much of the wooden, bucolic quality of Laurel Canyon was lost during this period. 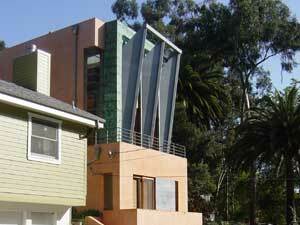 Just a few of the more expressive residences in Laurel Canyon. In addition to the vision of developers and architects has been the off-the-wall imagination of some of our more creative residents. One may take issue with the aesthetic, but there is certainly no community with as many eclectic home expressions as here in Laurel Canyon. Massive scale, huge retaining walls and a general disregard of the environment characterize the new mini-mansion. The late 1990’s saw tremendous growth in the California economy and in the personal wealth of some Californians. Home prices in the canyon that were already high went through the roof. So it was no surprise that a certain amount of showiness and ostentation also accompanied this growth. The result was an influx of developers eyeing prestigious lots on hilltops with fine views. The homes with the greatest return on investment were the new Mini-Mansions — lavish homes in a Mannerist style that pay no attention to the site or to the scale of the community and instead proclaim the ego of the owner. 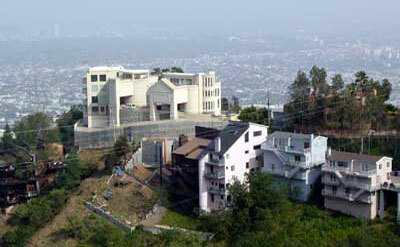 In some cases, these Mini-Mansions have severely damaged the natural contour and color of the hills. An example of a spec-built home that subsequent homeowners have softened with paint and landscaping. Given the live and let live attitude of the community, there is not much that can be done about legal development except for education. Developers and new homeowners will hopefully understand that Laurel Canyon is part of LA’s all-important greenbelt — the ridge of mountains running from Malibu to Pasadena. Each owner is a custodian of this precious resource and has a responsibility to balance personal ambition with preservation. For instance, a new generation of eco-sensitive homeowners are planting native vegetation and repainting the “white boxes” built by developers in browns and greens. Still others are using ground cover and terracing as opposed to sprayed cement to control hillside erosion. These are positive and incremental improvements that make homes more complementary to the environment. In the future, we will add more examples of how residents are helping to preserve the natural beauty of Laurel Canyon.